Christmas in Carleton Place House Tour 2018! “A CHRISTMAS HOUSE TOUR LIKE NO OTHER”! We are thrilled to announce that $10,741.42 was raised through this year's Christmas in Carleton Place House Tour! Thank you SOO much to our house tour guests, ticket sellers, wonderful sponsors, the more than 140 volunteers and especially the amazing homeowners who generously opened their homes to make this tour possible! Our best year yet for attendance and we are so very very appreciative! Homeowners and organizers extrodinaire, Jane and Steve, - we couldn't have done this without you! 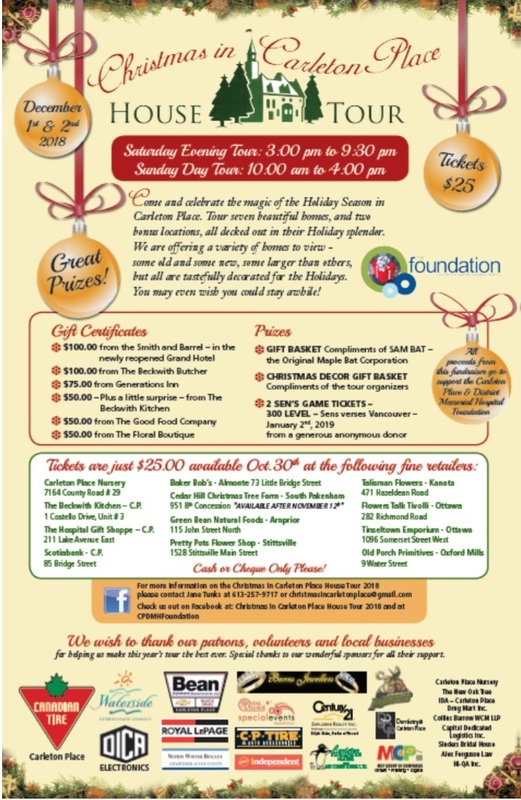 Come and celebrate the magic of the Holiday Season in Carleton Place. Tour seven beautiful homes, and two bonus locations, all decked out in their Holiday splendor. We are offering a variety of homes to view- some old and some new, some larger than others, but all tastefully decorated for the Holidays. You may even wish you could stay awhile! All proceeds go to the Carleton Place and District Memorial Hospital Foundation, towards the purchase of much needed patient care equipment. We can truly say, and have done so for the past six years, that our special tour is "A Christmas House Tour like no other!" We are the only Christmas House Tour offering an evening tour... There's something to be said for the twinkling of lights on a crisp winter's eve... It certainly helps to put one into the spirit of the Holidays! We are also the only tour where the homeowners are present and engaging...who else knows more about their special home than they do? Every home offers hot apple cider and cookies, and some have musical entertainment. The entire home is decorated top to bottom using the homeowner’s special decor, and chock full of ideas for the Holiday season...not simply just floral designs or staged decor. Our Christmas House Tour is very laid back, comfortable and welcoming...thus our catch line...."you may even wish you could stay awhile". Your ticket comes with a ballot for your chance to win one of several great prizes! Don’t miss out on this amazing tour and everything it has to offer in support of a great cause! !